To be published by University of Chicago Press, April 2010. Marx’s critique of capital was far broader than is usually supposed. To be sure, he concentrated on the labor-capital relation within Western Europe and North America. But at the same time, he expended considerable time and energy on the analysis of non-Western societies, as well as race, ethnicity, and nationalism. 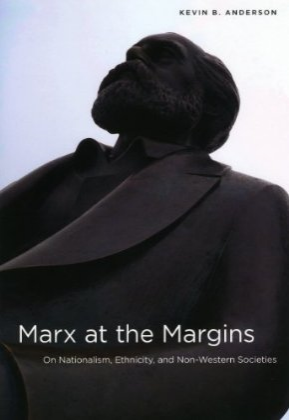 While some of these writings show a problematically unilinear perspective and, on occasion, traces of ethnocentrism, the overall trajectory of Marx’s writings was toward a critique of national, ethnic, and colonial oppression and toward an appreciation of resistance movements in these spheres. In 1848, in the Communist Manifesto, Marx and Engels espoused an implicitly and problematically unilinear concept of social progress. Precapitalist societies, especially China, which they characterized in ethnocentric terms as a “most barbarian” society, were destined to be forcibly penetrated and modernized by this new and dynamic social system. In his 1853 articles for the New York Tribune, Marx extended these perspectives to India, while viewing the communal social relations and communal property of the Indian village as a solid foundation for “Oriental despotism.” Postcolonial and postmodern thinkers, most notably Edward Said, have criticized the Communist Manifesto and the 1853 India writings as a form of Orientalist knowledge fundamentally similar to the colonialist mindset. By 1856-57, the anti-colonialist side of Marx’s thought became more pronounced, as he supported, also in the Tribune, the Chinese resistance to the British during the Second Opium War and the Sepoy Uprising in India. During this period, he began to incorporate some of his new thinking about India into one of his greatest theoretical works, the Grundrisse (1857-58). In this germinal treatise on the critique of political economy, he launched into a truly multilinear theory of history, wherein Asian societies were seen to have developed along a different pathway than that of the successive modes of production he had delineated for Western Europe. Marx also supported the Polish uprising of 1863, which sought to restore national independence to that long-suffering country. He and his generation of leftists viewed Russia as a malevolent, reactionary power, a form of “Oriental despotism” based in the communal social forms and property relations that predominated in the Russian village. It constituted the biggest threat to Europe’s democratic and socialist movements. Since Russian-occupied Poland stood between Russia proper and Western Europe, Poland’s revolutionary movement represented a deep contradiction within the Russian Empire, one that had hampered its efforts to intervene against the European revolutions of 1830 and initially, those in 1848 as well. As with India and China, by 1858 Marx also began to shift his view of Russia, taking note of the looming emancipation of the serfs and the possibility of an agrarian revolution, as seen in several of his articles on Russia for the Tribune. The labor and socialist networks that Marx helped to form in Western Europe in support of the U.S. and Poland were crucial to the founding of the First International in 1864. During his years of involvement with the First International Marx focused to a great extent on Ireland. His theorization of Ireland marked the culmination of his writings on ethnicity, race, and nationalism. British workers, he held, were so greatly imbued with nationalist pride and great power arrogance toward the Irish that they had developed a false consciousness, binding them to the dominant classes of Britain, and thus attenuating class conflict within British society. This impasse could be broken only by direct support for Irish national independence on the part of the revolutionary elements within British labor, something that would also serve to reunite labor within Britain, where Irish immigrant labor formed a subproletariat. On more than one occasion, Marx linked his conceptualization of class, ethnicity, and nationalism for the British and the Irish to race relations in the U.S., where he compared the situation of the Irish to the African-Americans. He also compared the attitudes of the British workers toward the Irish to those of the poor whites of the American South, who had too often united with the white planters against their fellow Black workers. In this sense, he was creating a broad dialectical concept of class, race, and ethnicity. By the 1870s, Marx returned to his earlier preoccupation with Asia, while also deepening his studies of Russia. Whereas he had previously concentrated on Russian foreign policy, he now began to learn Russian in order to study that country’s internal social structure. Marx’s interest in Russia increased with the publication of Capital in Russian in 1872, especially after the book generated more debate there than it had in Germany. Some of the changes Marx introduced into the 1872-75 French edition of Capital concerned the dialectic of capitalist development out of Western feudalism that was at the heart of the book’s part eight, “The Primitive Accumulation of Capital.” In direct and clear language, Marx now stated that the transition outlined in the part on primitive accumulation applied only to Western Europe. In this sense, the future of Russia was open, was not predetermined by that of Western Europe. During the years 1879-82, Marx embarked upon a series of excerpt notebooks on scholarly studies on a multifaceted group of non-Western and non-European societies, among them contemporary India, Indonesia (Java), Russia, Algeria, and Latin America. He also made notes on studies of indigenous peoples, such as Native Americans and Australian Aborigines. One core theme of these excerpt notebooks was the communal social relations and property forms found in so many of these societies. In his studies of India, for example, two issues emerged. First, his notes indicated a new appreciation of historical development in India, as against his earlier view of that country as a society without history. Although he still saw the communal forms of India’s villages as relatively continuous over the centuries, he now noted a series of important changes within those communal forms. Second, these notes show his preoccupation, not with Indian passivity as in 1853, but with conflict and resistance in the face of foreign conquest, whether against the Muslim conquerors of the medieval period or the British colonialists of his own time. Some of that resistance was, he argued, based upon indigenous communal forms. If Marx’s theorization of nationalism, ethnicity, and class culminated in his 1869-70 writings on Ireland, those on non-Western societies reached their high point in his 1877-82 reflections on Russia. In a series of letters and their drafts, as well as the 1882 preface to the Russian edition of the Communist Manifesto he co-authored with Engels, Marx began to sketch a multilinear theory of social development and of revolution for Russia. Russia’s communal villages were contemporaneous with industrial capitalism in the West. If a village-based social revolution in Russia could draw upon the resources of Western modernity by linking up with a revolution on the part of the Western labor and socialist movements, Russia might be able to modernize in a manner far different from capitalist development, he wrote. Moreover, a revolution in rural Russia could be the “starting point” for such an international revolutionary outbreak, he concluded. In sum, I argue in this study that Marx developed a dialectical theory of social change that was neither unilinear nor exclusively class-based. Just as his theory of social development evolved in a more multilinear direction, so his theory of revolution began over time to concentrate more on the intersectionality of ethnicity, race, nationalism, and class. To be sure, Marx was not a philosopher of difference in the postmodernist sense, for the critique of a single overarching entity, capital, was at the center of his entire intellectual enterprise. But centrality did not mean univocality or exclusivity. Marx’s mature social theory revolved around a concept of totality that not only offered considerable scope for particularity and difference, but also on occasion made those particulars — race, ethnicity, or nationality — determinants for the totality.